Staff Attorney Kate Maxham stands next to a painting by artist and historian Bill Lee that hangs in the Fairfield Probate Court office, in Fairfield, Conn. Sept. 6, 2018. 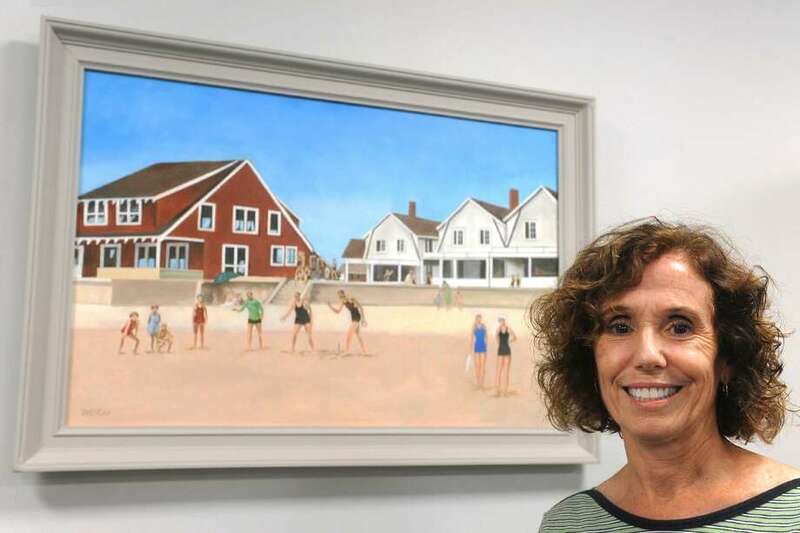 Lees painting depicts his childhood memories of time he spent on the beach in Fairfield in the 1920s. Attorney Laura Shattuck, of Parrino|Shattuck PC, was selected by her peers for inclusion on the 2019 list of the Best Lawyers in America. With this distinction, Shattuck ranks among the very best private-practice attorneys nationwide. Attorneys listed in the 25th edition of The Best Lawyers in America were selected after a peer-review survey that confidentially investigated the professional abilities and experience of nominated lawyers. Recognition by Best Lawyers is widely regarded by both clients and legal professionals as a significant honor. Shattuck, a longtime resident of Fairfield, was selected for the list in the practice area of family law. Her selection comes on the heels of numerous other recent awards, including being recognized for lifetime achievement among America’s Top 100 Attorneys. Shattuck is a partner and co-founder of Parrino|Shattuck PC. She devotes her practice to representing clients in all areas of family law. She is actively engaged in litigation and has substantial experience working on sophisticated cases. For the 2019 edition of The Best Lawyers in America, 7.8 million votes were analyzed, which resulted in nearly 60,000 leading lawyers being included in the new edition. Lawyers are not required or allowed to pay a fee to be listed; therefore, inclusion is considered a singular honor. Parrino|Shattuck PC, at 285 Riverside Ave. in Westport, represents individuals in a wide range of family law matters. For information, visit parrinoshattuck.com or call 203-557-9755. Impact Fairfield County has announced a $100,000 grant opportunity to nonprofits for significant projects or programs that reach underserved populations and highlight unmet needs in the area. It is anticipated that Impact Fairfield County will award one or two grants of $100,000 each, determined by membership on May 1. Applying for a grant starts with a letter of inquiry. Organizations may only submit one application each grant cycle. Letters of inquiry will only be accepted online beginning Oct. 17 and will be due Nov. 14. Potential applicants may attend an optional information session, which will be held on Tuesday from 10 to 11:30 a.m. Coffee will follow from 11:30 a.m. to noon at the offices of the Fairfield County’s Community Foundation, 40 Richards Ave., fourth floor, Norwalk. RSVP is required by Friday, Sept. 14, to grants@impactffc.org. Due to limited space, only one representative from each organization may attend. The 10th annual ROCK4RV CJD Benefit Concert will take place Sept. 22 from 4 to 11 p.m. at the Fairfield Theatre Co. Warehouse. The event is in memory of Robert Vitanza, a former Fairfield County resident who died from Creutzfeldt-Jakob disease in 2008. Area ROCK4RV bands will include Simple Jim (with Mike Vitanza) and the School of Rock Fairfield All-Star Band. Doors open at 3:30 p.m. Funds raised go to The CJD Foundation Inc., a nonprofit organization committed to supporting individuals and families affected by the rare and fatal neurodegenerative disease. Live music, food trucks, a face-painter, photo booth, raffles and more will be featured at the event. Tickets are $20 in advance at fairfieldtheatre.org, or $25 at the door. Tickets for kids 12 and under are $10. Raffle tickets will be available on site. Patricia A. Bendick and her staff have welcomed Melissa Landin to Fairfield Orthodontic Associates, at 111 Beach Road in Fairfield. Primarily serving the communities of Fairfield, Westport, Easton and Weston, Fairfield Orthodontic Associates has patients from throughout Fairfield County. Originally from Newtown, Landin grew up in a home attached to a dental office. Her father is a general dentist and her mother was his hygienist for many years. Filling in at the front desk and as the dental assistant when needed, dentistry was always something Landin thought of as a career. Landin attended Fairfield University and completed both her dental and orthodontic training programs at the University of Connecticut Health Center in Farmington. Prior to enrolling in dental school, Landin excelled in General Electric’s leadership-development program, the Financial Management Program. Landin is trained in both early childhood and adult orthodontics. Committed to learning the newest technologies and staying abreast of the current orthodontic and dental trends, Landin maintains active memberships in the American Association of Orthodontics, American Dental Association and Connecticut State Dental Association. For information about Landin, visit fairfieldorthodonticassociates.com or contact203-256-9500 or ffldortho@gmail.com. St. Paul’s Episcopal Church will celebrate the installation of its 16th rector, the Rev. Curtis Farr, on Saturday at 10:30 a.m. during a service open to the public. Suffragan bishop of the Episcopal Church in Connecticut, the Right Rev. Laura Ahrens, will preside over the “Renewal of Ministry with the Welcoming of a New Rector.” The Rev. Ranjit Mathews Rector, of St. James Episcopal Church in New London, will preach. Services are on Sundays at 8 and 9:30 a.m. and 5 p.m.